Ready to test your endurance and take your running to the next level? 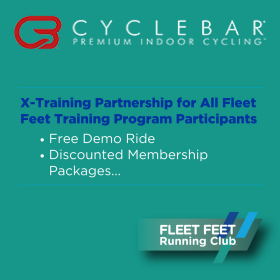 Fleet Feet Running Club - Montclair has two programs to offer supporting the running community whether you are racing your first half OR your first full marathon ... or, if you are a seasoned endurance runner who wants to bust through your plateau. Choose the distance that works best for you and we'll support you throughout your journey. The 10-week Half Marathon Training Program prepares runners for their first endurance event and helps seasoned racers meet a new performance goal. Get ready to be trained, educated, and moved to successfully and comfortably cross the 13.1 mile finish line. Training will start with a distance of 4 miles and build up over the course of the program. We're renting a bus to take class participants to and from the goal race with lots of fun and shenanigans as we traverse Washington Crossing Historic State Park! 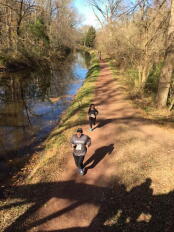 Fleet Feet's 2018 Fall Half Marathon Training gears you up for the DELAWARE CANAL HALF MARATHON in Washington Crossing, PA, part of the Bucks County Marathon Series. Class will NOT BE HELD on Labor Day weekend, Saturday, September 1st. *Due to darkness Tuesday sessions will move to Brookdale Park in mid-October. Safety blinking lights and reflective gear are required for all Tuesday night runs. *$25 bus transportation fee included in program registration price. Bathroom on bus. CONGRATULATIONS TO OUR 2017 FALL HALF MARATHON GRADUATES! "Fleet Feet's training programs have changed my life. I started training with Fleet Feet in 2014 in the 5k No Boundaries class and ran my first half marathon 13 months later, after completing my first half marathon training program with Fleet Feet. 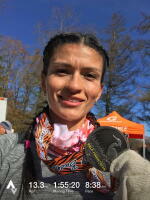 I have run 5 half marathons (as well as many other races) and trained with Fleet Feet for all of them. The coaches, their support and knowledge are second to none. You become a part of their community. Description: The Half Marathon Training Program is a 10-week program specifically designed to prepare runners for their first endurance event and/or help seasoned runners meet a new performance goal.